With warmer weather fast approaching our patios, decks and porches are going to get a lot more use. 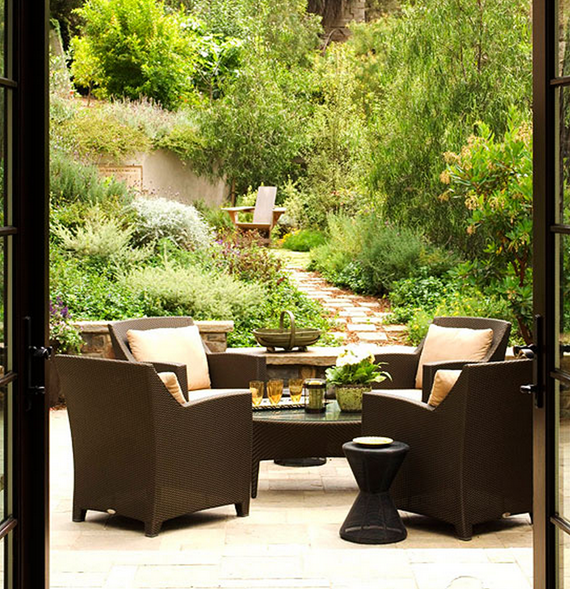 Here is California, our outside living is an extension of what’s inside and therefore its critical that the design flows from one space to another. In the past, outdoor fabrics have been ho-hum and frankly there hasn’t been much selection. Over the past few years however, I’ve seen a huge uptick in beautiful designer outdoor fabrics. And these chic, yet durable fabrics are great for indoors too. For a client with young children and pets, I recently installed several chairs, window cushions and pillows in outdoor fabrics. What fabulous outdoor fabrics! I can’t wait to start decorating my backyard for spring. I want to get a new firepit this season. Love the outdoor fabrics and so wish Texas did not get so hot! Even with the summer heat we still manage to sit out after sundown to count we call Texas Night Stars. Fav pic #2 and #4 and the walking path in the photo. Have a wonderful weekend. Happy Friday! I love decorating my backyard, especially when there’s so many beautiful options. I love the simplicity of #3, and all the bright color choices.